The Save page of the Printing Preferences window allows you to configure save options for the generated PDF file and add after-save actions. 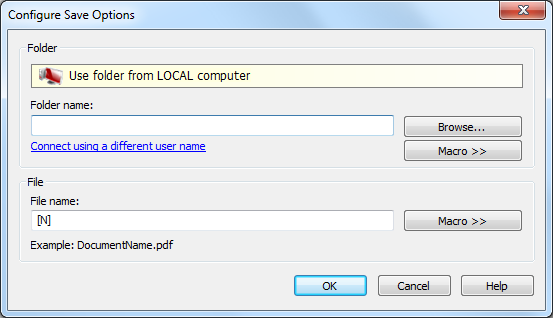 You can also set the auto-save feature when printing the PDF files to directly save the file in a predefined location. 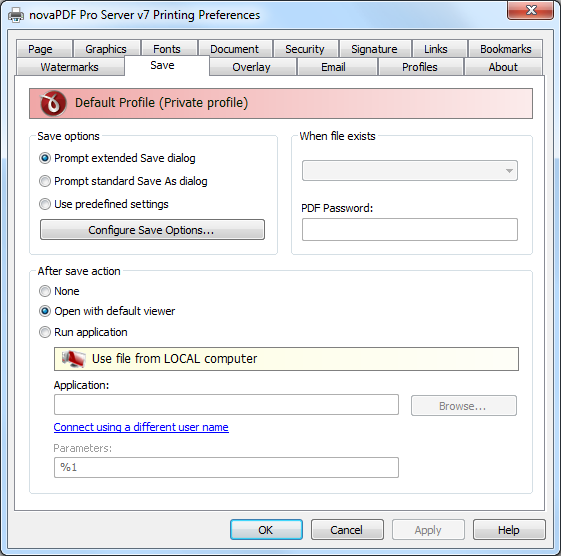 The window can be opened by choosing the Printing Preferences menu item when novaPDF is selected in the Devices and Printers window and clicking the Save tab. This tab is also accessible from the printing Windows application in the Print dialog if you press the Properties (Preferences) button when novaPDF is selected. Save options - This group allows you to choose if the PDF will be automatically saved to a location or a dialog will be displayed each time. Prompt extended Save dialog - If this is selected, each time you will create a PDF file you will be prompted with an extended save dialog where you can manually set the destination folder and file name for the generated PDF file, whether to append or insert the content being printed to an already existing PDF file, and what to do once the PDF is created (open it with the default viewer or send it via email). Using the Configure Save Options window you can add a default path to be remembered for each time you create a PDF file, as well as to automatically assign a name for the PDF file (using macros). This way when this extended save dialog will prompt, the default path will be opened and the name auto-generated. Prompt standard Save As dialog - If this is selected, each time you will create a PDF file you will be prompted with the Save As dialog where you can manually set the destination folder and file name for the generated PDF files. Using the Configure Save Options window you can add a default path to be remembered for each time you create a PDF file, as well as to automatically assign a name for the PDF file. This way when the Save As dialog will prompt, the default path will be opened and the name auto-generated. Use predefined settings - Select this if you prefer to automatically save and name all generated PDF files in the same folder that can be defined in the Configure Save Options window. PDF Password - If you selected in the File Name section an already existing PDF file and you want to merge the current document with it, you'll have to enter the password needed to open the existing one (only if it's password protected). If the PDF you want to merge with is not password protected, you must leave this field empty. Run application: if this is selected, you can choose an application to run after the PDF if saved. You can also add some parameters that will be passed to the application when started. You can also enter network paths (UNC) in the Application field in case the application you want to launch is not on the local computer. Only a full path is allowed. For example, suppose \\PDF_Server\PC1 is mapped on your workstation as drive X, then the following paths are both valid and indicate the same folder: \\PDF_Server\PC1\PDF or X:\PDF. It the network file requires authentication (different from your user login) you have to click on Connect using a different user name and enter the username/password. Configure Save Options is available when clicking the same named button from the Save window after selecting the Prompt standard Save As dialog or Prompt extended Save dialog option. You can set the folder where the PDF files will be saved after generation and add file-naming macros to automatically name the generated PDF. Use current user's default Documents folder - When this option is selected, the Save As dialog for the PDF file will be opened with the Documents folder selected (for the current logged in user). Use printing application's current folder - When this option is selected, the Save As dialog for the PDF file will be opened with the printing application's current folder selected. Use this option when you usually want to save the PDF file in the same folder as the original document that you are printing. 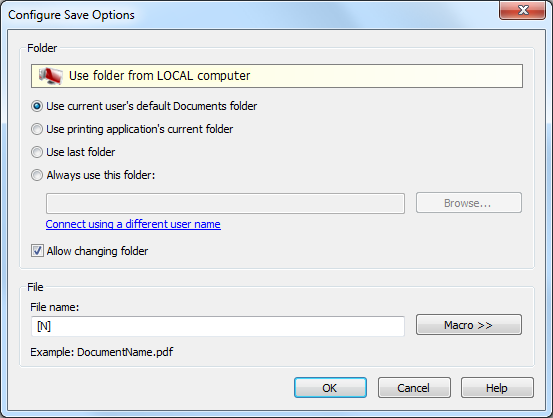 Use last folder - When this option is selected, the Save As dialog for the PDF file will be opened with the last used folder selected. Use this option if you wish to save several PDF files in the same folder, or if you want to append new generated PDF files to the previous generated PDF file. Always use this folder - In the Folder field you can set a folder where the files will be saved. The path you enter here will be shown on the Save As dialog when printing. Allow changing folder - If this option is unchecked, when you print from a program and Prompt Save As dialog or Prompt extended save dialog is selected, you will not be able to change the folder where the PDF is saved from that dialog, but only the filename. If you want to be able to change the folder where the PDF is saved from that save as dialog, leave this option checked. File name - You can manually type a name for the generated PDF file in the File name field or use Macro to automatically name the PDF file created. Configure Save Options is available when clicking the same named button from the Save window after selecting the Use predefined settings window. You can set the folder where the PDF files will be saved after generation, add file-naming macros to automatically name the generated PDF and choose what to do if a PDF file with the same name already exists in the destination (for instance merging the PDF files). Folder - In the Folder field you can set a folder where the files will be saved. The pdf files will be automatically saved in this folder without manual intervention. You can also enter network paths (UNC path) in the Folder name field in case you want to save the PDF on another computer in your network. Only a full path is allowed. For example, suppose \\PDF_Server\PC1 is mapped on your workstation as drive X, then the following paths are both valid and indicate the same folder: \\PDF_Server\PC1\PDF or X:\PDF. If the network file requires authentication (different from your user login) you have to click on Connect using a different user name and enter the username/password. Can connect to novaPDF, but cannot print any file. Create pdf files without diplaying the Save As dialog.